Donna has always wanted to be a dental hygienist. She graduated from Virginia Western Community College in Roanoke, Virginia, and worked in several different dental offices throughout Virginia before joining Dr. Peer's team. Donna has been with Dr. Peer since 1994, and through his office, she regularly attends continuing education workshops and seminars to keep up with the latest studies and equipment available to dental hygienists. Donna enjoys visiting different wineries, playing with her grandchildren and spending the weekends with her husband riding their Harley Davidson. Tara pursued a degree in dental hygiene after spending several years as a dental assistant. She attended Virginia Western Community College and graduated with an associate's degree in dental hygiene. Tara has been proudly working with Dr. Peer since 2004, during which time she has received many of her continuing education credits while traveling to seminars and workshops in different states. She enjoys working with the latest dental technology and believes it is essential to providing patients like you with the best care available. Tara and her husband enjoy traveling and spending time with their three beautiful children. Tracey has been a privileged member of Dr. Peer's team since 2005. During this time Tracey has not only worked as a business assistant, handling scheduling and billing, but also as a trained dental assistant. Tracey enjoys working one-on-one with patients explaining treatment plans and making financial arrangements that meet their needs. In her spare time, Tracey enjoys spending quality time with her husband and daughter. She is a big Dallas Cowboys fan and enjoys the occasional Kid Rock concert. Vickie began working as a business assistant for Dr. Peer in 2000. She enjoys working with patients like you and believes excellent customer service is the first step in building a trusting relationship between the patient and dental team. Her genuine care and concern for each patient makes her a valuable asset to the practice. Vickie is married to her high school sweetheart. They have two grown children and four grandchildren. Teresa was born in Halifax County, but decided to move to Florida when she was in her late teens. After getting married and having children, she decided it was time to return to her roots in Virginia. Teresa has been part of Dr. 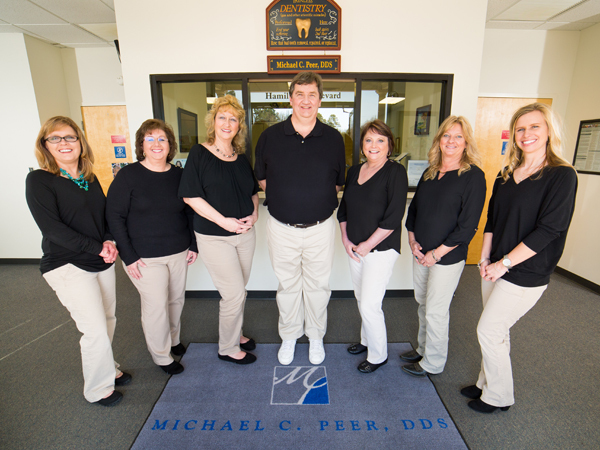 Peer's dental team since 1997. "We have a great staff, and I love my job where I get to serve my community." Teresa enjoys horseback riding and spending time with her family, and her favorite place to be is the beach. Allison was born and raised in Halifax County, Virginia. She enjoys working with people, and she believes that all of our patients should receive the best personal dental care possible. Allison is married and has two boys; her family and friends are very important to her. She enjoys boating and spending quality time with her husband and sons.